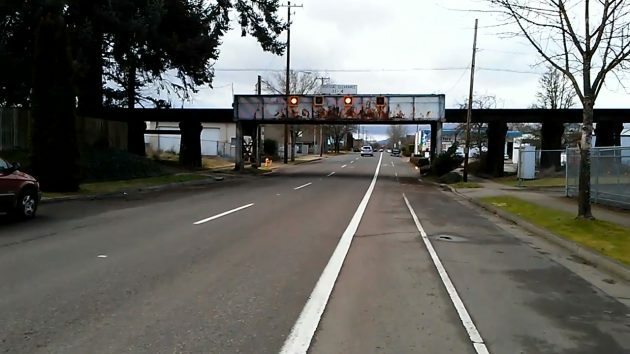 There were never any good excuses for trucks hitting the trestle on Albany’s First Avenue, and as the video shows (after some wobbles inherent in one-handed videography while steering a bike) that’s even more true now that bright new flashing lights have been installed as an additional warning. I reported before on the Albany city administration’s efforts to further reduce the chances that unwary drivers would ram their trucks into the railroad bridge, where the 11-foot-4 vertical clearance is less than standard. There had been flashing lights by the side of the street a block ahead of the trestle, in addition to truck-detour signs. But late last year, as a first step, after discussions at the city council, the city made those roadside flashing lights brighter. It also got the Portland & Western Railroad’s consent to replace and improve the four warning lights on the bridge itself. The bridge lights had been on the dim side, barely noticeable, and the two in the middle had been burned out for some time. You can see the new lights from a good distance. There are plenty of deterrents those flashing lights should help. Those who hit the trestle are looking at google not the signs. As proven by ‘The Canopener Bridge”, it’s unlikely that any amount of warning signs will prevent bridge incidents. Most of their incidents don’t involve the bridge itself, but a steel I-beam placed at bridge-height before the bridge. I trust it felt great to be back on your bike! Using video reinforces the Hering message. That said, might I suggest you invest in a 3-axis handheld gimbal to steady your camera while you are piloting the pedal powered vehicle down Albany’s bicycle [moderately – friendly] streets. While not inexpensive, the quality of your image would improve dramatically, adding a compelling visual dynamic while supporting the Hering Vision. You could add a drone for those unique perspectives. At least the lights are mounted near the top of the bridge and not the bottom. That way when the truckers ignore everything and hit the bridge anyway, at least we will not have to replace the flashing lights every time.